This entry was posted in News on July 23, 2008 by Ron Kaplan. This entry was posted in News on July 11, 2008 by Ron Kaplan. improvisations, true to this art form – jazz! And I truly enjoyed each and every minute! The concert was held at Alan Goldman’s stunning home theater in the hills of Mt. a double ending doing it her way and then Mr.B’s! What a treat, thank you, Gina!! talented interpretation and feeling for the music. Jobim’s “Girl From Ipanema”, and again, very tasty! with her sensitivity and gorgeous voice! was written in 1934 by Sam M. Lewis and J. Fred Coots. shines on bossas, swings with the best, and is sterling on slow ballads as well. a nice lift and set up another opportunity for John Hatton to get down with a bass solo. thanked us all for being there to support this music and all the singers… then Jimmer gave us a swingin’ rendition of a gem by Fats Waller and Andy Razaf, “Honeysuckle Rose”. that worked great with Jimmer’s voice. Johnny Mercer. Warm and beautiful, Ron! last note!!! The universe did! Ken Koenig and crew for documenting a great day! confirmation that the legacy of Jazz and the Great American Songbook is alive and well! wonderful songs to learn them myself! This entry was posted in News on May 11, 2008 by Ron Kaplan. This entry was posted in News on May 1, 2008 by Ron Kaplan. APTOS, CA ­ November 27,2006 ­ The American Songbook Preservation Society, a not-for-profit Foundation, flew a plane with banner in tow around the corporate headquarters of Oracle in a plea for a charitable donation from CEO Larry Ellison on November 2, 2006, in Redwood Shores, CA. The monies would endow the Foundation, in perpetuity, to fulfill it’s mission: to preserve our cultural treasure known as the Great American Songbook, by presenting this music to the public at home and abroad as Ambassadors of Song. The request comes as a result of a 2005 settlement requiring Ellison to dispense $100 million within 5 years to the charities of his choice. this music in front of the American Public and the world for the next 100 years and beyond. But on November 17, 2006, the Foundation had received their reply from Oracle Corporation that there would be no funds available as the $100 million has already been designated. “Had our ‘out of the box’ guerilla marketing attempt succeeded, it would have endowed our non-profit foundation in perpetuity. My intention is to find a suitor to underwrite our Foundation and allow me to build an organization to keep this music in front of the public for the next 100 years and beyond. I had received a pledge of support from Wynton Marsalis early on and at the advice of Nat Hentoff, who thought the organization was a wonderful idea,” said Kaplan. concept of the GreatAmericanSongbook.org is very patriotic. “We are looking for donors who believe in the American Cultural Legacy and want their name or business associated with the Foundation in perpetuity as we fulfill our mission. The end of the 2006 tax year is rapidly coming to a close. We are asking that concerned individuals help us make this happen with their support, and as the Bert Kalmar, Harry Ruby and Oscar Hammerstein II song goes, ‘Give Me A Kiss To Build A Dream On'”. This entry was posted in News on December 28, 2006 by Ron Kaplan. Allstate agent Ron Kaplan’s Volunteer efforts for the American Songbook Preservation Society has been rewarded with a $500 grant to the organization. The funding comes from the Allstate Foundation’s Agency Hands in the community program, which began in 2003. Kaplan, of Aptos, is the founder and executive director for the American Songbook Preservation Society, which performs classic musical works from the 1920’s to the 1960’s. The grant will underwrite the presentation of free and low-cost concerts in the community and throughout the country. This entry was posted in News on August 7, 2006 by Ron Kaplan. I’ve been listening to Dennis Murphy’s new album, “Rediscovery,” a collection of songs made famous by Frank Sinatra. Unless you’re a Sinatra fan or you listen to a radio program that plays these standards, you don’t hear them very often. They’re part of the American Songbook, a large group of songs that include Tin Pan Alley tunes and the great New York and Hollywood musicals, a period from the 1920s through the 1960s. Like a lot of Americana, this cultural legacy seems to be fading from the nation’s collective consciousness. How can we keep it from fading into black? 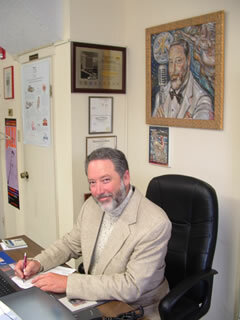 Enter Ronald Kaplan, founder of the American Songbook Preservation Society. The Aptos insurance agent and jazz singer has launched a quest to raise $25 million to do just that. Kaplan has laid the groundwork for the American Songbook Preservation Society. He received a certificate of nonprofit management and has organized as a nonprofit in California. And he has received pledges of support from jazz writer Nat Hentoff and jazz musician Wynton Marsalis. He now is courting a major donor, and the manager of the Algonquin Hotel in New York also has pledged his support. The plan is to make the hotel a home venue for the society and for young singers to perform there. “I’m very excited about that,” Kaplan said. Other plans are to present singers of the American Songbook in high-profile concerts and jazz festivals throughout the United States and overseas and to work for lower ticket prices. If it all unfolds as Kaplan believes it will, new generations will come to know and appreciate the music of such great American songwriters as Irving Berlin, Cole Porter, Rogers and Hammerstein, Duke Ellington and many others. “It’s our gift to the world,” Kaplan said. Make a donation to the American Songbook Preservation Society and find out more about it at www.greatamericansongbook.org. This entry was posted in News on October 6, 2005 by Ron Kaplan.